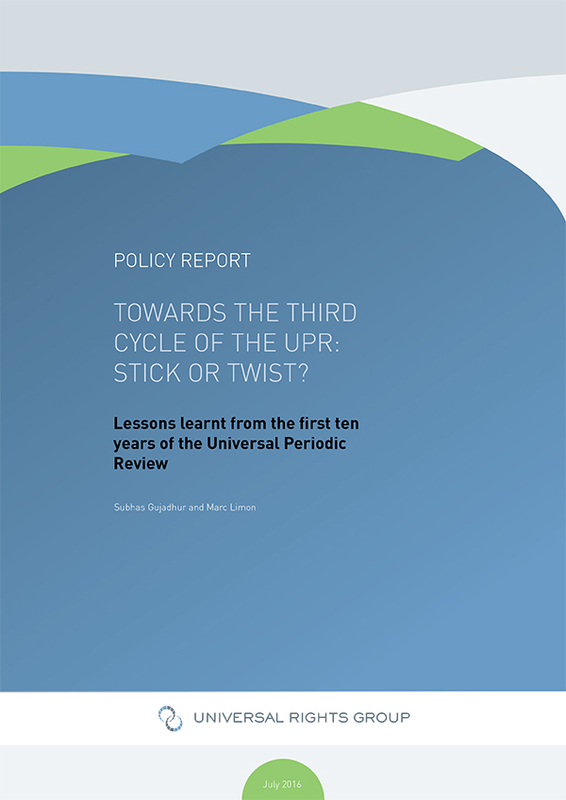 Towards the third cycle of the UPR: stick or twist? In 2005, Heads of State meeting at the UN’s World Summit resolved to create the Human Rights Council and asked the President of the General Assembly to begin negotiations to establish its mandate, functions, composition and working methods. One of the defining outcomes of those negotiations would be the decision to establish, as a central pillar of the Council’s work, a new mechanism: the Universal Periodic Review (UPR). The new Council met for the first time in June 2006, and began negotiations on an ‘institution-building package,’ which was to include ‘the modalities of the universal periodic review mechanism.’ Negotiations on the UPR, which were often difficult, focused on a number of key themes, including: normative foundation of the reviews; principles; periodicity of reviews; modalities; documentary basis of reviews; conduct of reviews; and outcome of the UPR. The end result was adopted as resolution 5/1 on 18th June 2007. Five years later, on 25th March 2011, the Council adopted resolution 16/21, presenting the outcome of its five-year review. The overall package contained in resolution 16/21 was notably unambitious, though the Council did agree on some important changes to the UPR. The sum total of these innovations and reforms is a mechanism that today has assumed a central role in the international human rights promotion system, and which is widely seen as a success. Key to that success is the mechanism’s universality – the notion that it covers, potentially, every human rights concern in every country – as well as its peer review and cooperative character. Notwithstanding these strengths, as the UPR mechanism nears the end of its second cycle (which will conclude in 2016/2017), questions are being asked about whether it can maintain its success in the medium- to long-term. It is therefore important, ahead of the third cycle, to analyse and learn lessons from the first two cycles, and to give careful consideration to whether it is necessary to introduce certain reforms to the mechanism. Should States maintain the status quo, or are some tweaks desirable? From a political standpoint: should international policymakers stick or twist? URG’s multi-year project on the UPR seeks to answer these questions. It seeks to analyse and understand the political history of the UPR from its inception to the end of the second cycle. The project then analyses each stage of the ‘UPR cycle’ to see what lessons can be learnt from the UPR’s first ten years, to identify achievements and weaknesses, and to offer ideas for the future strengthening of the mechanism. The final results and conclusions are presented in a new URG Policy Report.